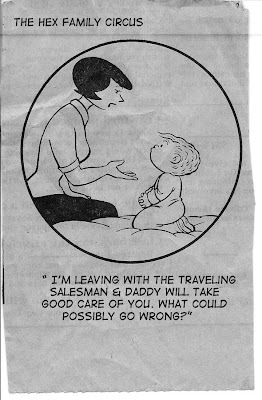 I was rooting through some old newspaper clippings and found this. 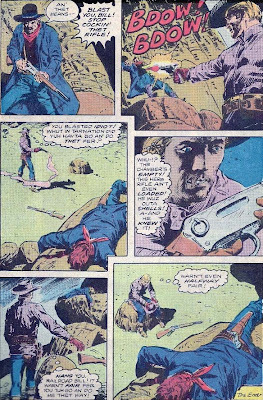 I have been lax in keeping the Jonah Hex Injury List updated, so I am going back through and adding issue links to each injury. Once I get THAT caught back up, I'll start on the timeline. 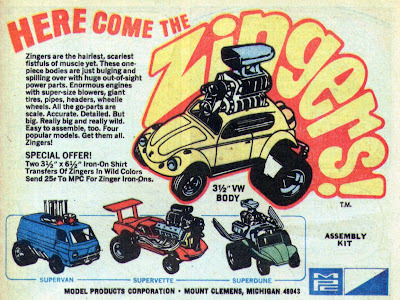 I had all of these beauties and they were twice as fun as the ad shows. 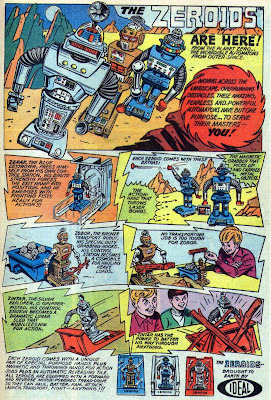 ROBOTS!!!!! Guess what ya can't buy anymore? A DSL modem. At least you can't buy one at Radio Shack, Target, Best Buy, Office Depot, Ultimate Electronics, 7-11, Barnes & Noble. You can buy one from AT&T but it would only be the same sucky piece of trash that only lasted a year. So I stumbled into Staples and $97 later I stumbled out with a DSL Modem/Wireless-N router combo. Sheesh. But I'm back up & running. Well, Dad was out of town this past weekend and his modem decided then would be a good time to die. After a lengthy conversation with the friendly neighborhood ISP, they figured out a new modem was needed. As soon as he gets one normal posting will resume. Eldest here. 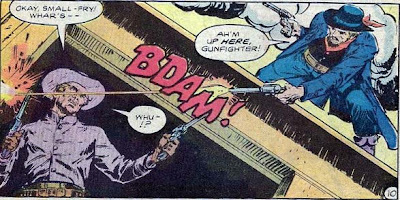 Just read this article over at Comics Should Be Good. Crazy how much impact stories can have on someone. Morrison would be proud. Bleah. Allergies have got me town (tree pollen must be through the roof) and we ended up postponing a weekend getaway to Dallas to see the King Tut exhibit. We left the house this morning and after about 30 minutes I told my lovely wife that I needed to go home. Went to bed & just got up. I got nothing scanned but several things in the works, but nothing ready. 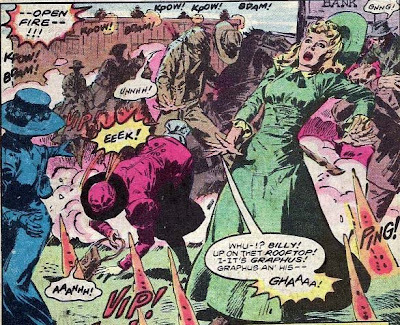 Might as well talk about the Jonah Hex movie. 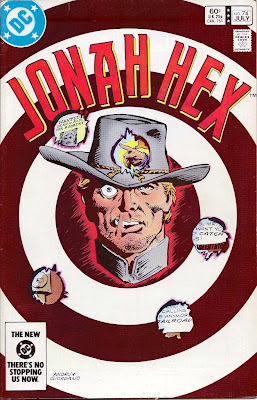 Jonah Hex - targeted release date August 6 2010. Not a promising release date, but at least it ain't February. (Feb is the time they dump the worst of the worst). Josh Brolin as Hex. Having only seen No Country for Old Men, I think this is a good pick. Brolin can play the steely-eyed non-talker with ease. I'm looking forward to this. John Malkovich as Turnbull. When I first heard of this, I wasn't too thrilled. After watching Rounders, I'm stoked. Having a big (ger) name as the villain usually helps but not always. We'll have to see how he plays our favorite Soutern master manipulator. Megan Fox as Leila. Erg. Don't know much about her other than I've never knowingly seen her in a movie. "Leila". Hmmm, no Mei Ling that's for sure. Michael Shannon as Doc Cross Williams. I know nothing about him & this is a new character. We'll have to see how this plays out. Will Arnett. This man did the announcer in the "Don't" trailer in Grindhouse. That & playing Vlad in Horton Hears a Who brings thumbs up from me. Speaking of Horton, that brings up Jimmy Hayward, the director. His only prior directing credit is Horton, but he has worked in the animation of Finding Nemo, Monsters Inc., Toy Story 2, Bug's Life, & Toy Story. It looks like he has worked on films that know how to have a good compelling story with a nice rhythm and flow. I'm giving this a thumbs up as well. A good director doesn't guarantee a good film (cough Hulk cough). Now, what about the plot. Everyone thinks they know what is going down, from a rewrite of a plot from years ago to Turnbull being a voodoo daddy raising the Confedrate dead. 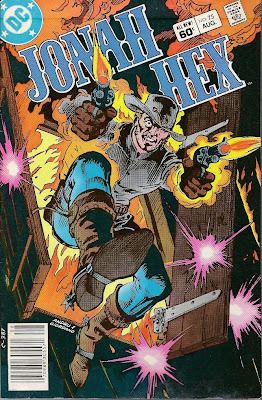 A lot of noise is pointing towards the Vertigo Jonah Hex (that I haven't reviewed here yet, but might jump ahead prior to the movie being released) but I still hear conflicting stories about the range of the weirdness that is going to be on the screen. This casting call shows that we are going to get some startling visuals, including amputees, 'unique features', and Carnys. Here are a few pictures of one of the sets. One thing does bother me and that is the IMDB page lists John Albano & Tony DeZuniga with writing credits for the characters. 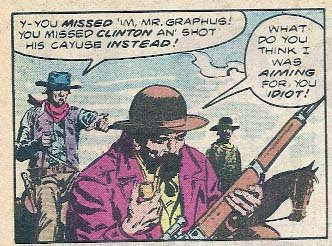 This is true for Jonah Hex, but Michael Fleisher first wrote Quentin Turnbull. I'll have to see what I need to do to fix that. 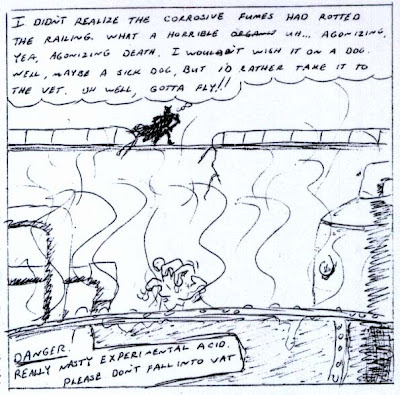 A spaceship has crashed in the desert and the pilot is dying, his life seeping into the sands surrounding his vessel. He is a member of the Green Lantern Corps, intergalactic guardians of freedom and protectors of interplanetary justice. He orders his ring to seek out a replacement for him, a man of courage that knows no fear. So the ring locates a man several miles away and starts leading the man towards the wreckage. Buffeted by the heat, the man makes his way across the sands, led by "voice" in his head. When he finally sees the twisted metal of the intergalactic ship, he is amazed, but still he moves forward looking deeper into the wreckage. 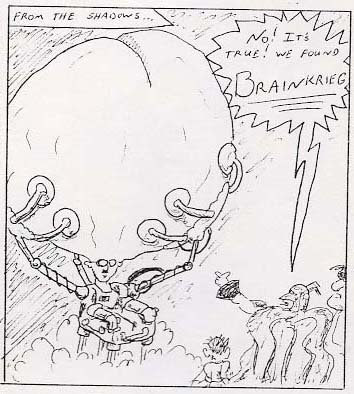 He finally finds the body of the pilot, but Abin Sur is dead and no explanations are forthcoming from the weirdly costumed body of the extraterrestrial. The man stands up, looking towards the horizon, wondering if anyone else has seen the remains of this ship. Before he can even consider his next step, the ring flies onto his hand and his mind is flooded with the knowledge of the Green Lantern Corps and that he is now a member of the Corps, guardian of sector 2814. No longer would he be a normal man. 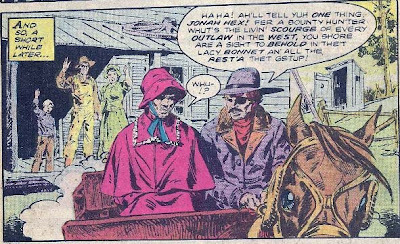 He will from now on be known as a Green Lantern, never again to be known as Jonah Hex! 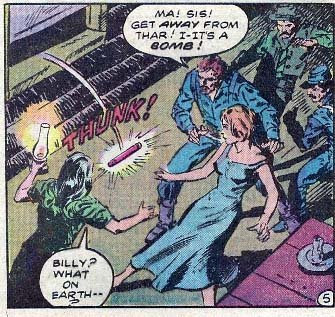 I envision a Lantern even more bloodthirsty than Guy Gardner being unleashed upon the cosmos. 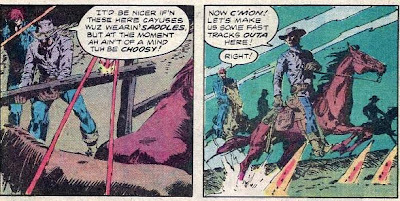 Constructs based on the life of the Old West abound in the coldness of outer space. 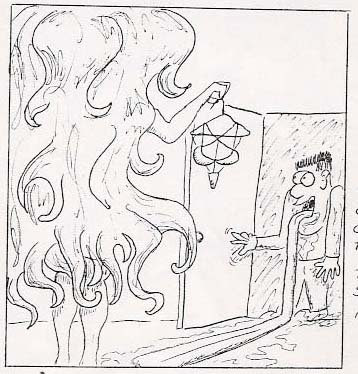 And perhaps, just perhaps, Jonah ends up encountering the original Terra-Man. Feel free to dream and expound upon your thoughts. 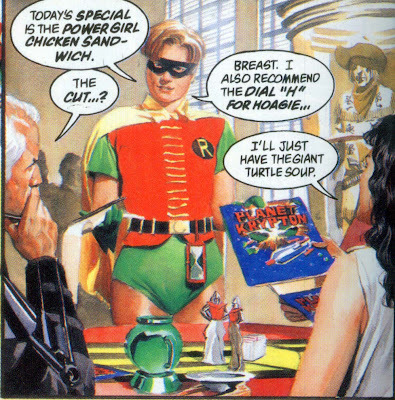 Personally I think it would be one helluva Elseworlds book. I actually had the van. There was no way that you could locate the VW bug. It was awesome!! Getting one now on ebay will cost more than I'm willing to pay. Tung is unable to close the door as Chic gets ready for their trip to the beach. 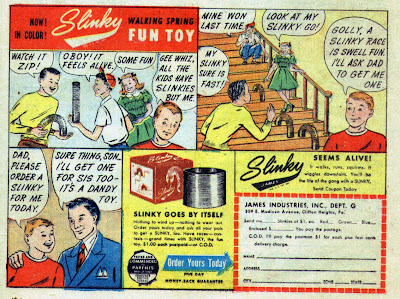 Yup a cool toy until you got into a fight over it and stretched it waaaay too far. I would rather have had one made out of Rearden Metal. This was the idea of Eldest! And then THIS Lantern showed up!!! and this Lantern arrived and grabbed ALL the eggs! 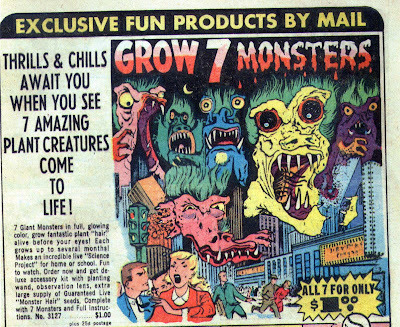 Howkum you can grow 7 monsters but they only show you 6? It must have been so horrible that the artist died of fright before he could have rendered it in all of its horrible glory.